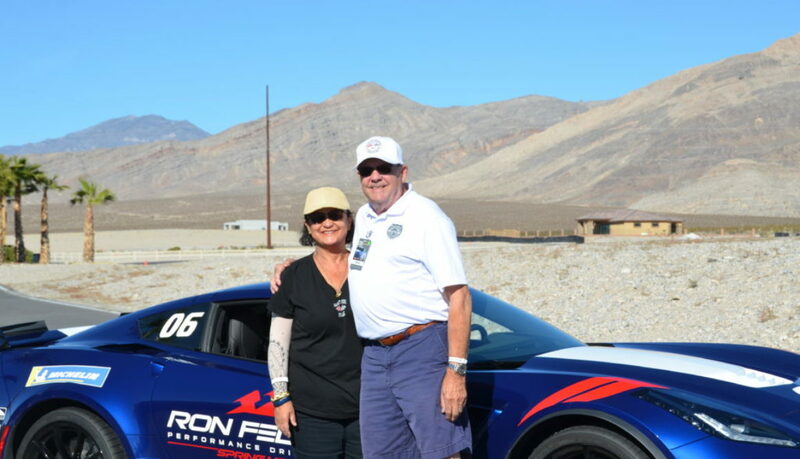 Several of our Santa Clarita Valley Corvette Club members have attended the Ron Fellows Performance Driving School in Pahrump, NV, while many more have not. General Motors picks up the majority of the tuition for new owners of C7 Corvettes to attend the two-day Corvette Owners School during the first year of their ownership. To date, I haven’t read any reviews about the school written by our club members in our Newsletter, so I thought, why not share some of my experiences for others who have not yet attended and maybe even for those who have gone? So, here goes. I bought our 2017 Grand Sport in August of 2017 and looked forward to attending the school and somehow, life prevented me from getting signed up right away. We all have things going on and priorities are just that too. Additionally, you might remember my torque tube bearing issues and another warning light advising me to “service rear axle.” Then there were great club events I wanted to participate in and all of a sudden, it’s August 2018! A year of C7 ownership has almost passed and my time to claim the tuition saving GM offered (which we all probably actually paid for) was about to expire. 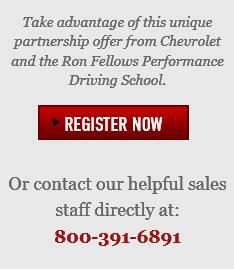 Not wanting to miss out or to pay full price for the school, I called the reservation number for Ron Fellows hoping for a reservation but understanding the problem was on my end and not theirs. What a relief to hear after pleading my case that GM granted me an extension and that I would soon be attending the school. They even offered me a class date of November 5th, after the summer heat was over and the desert temperatures were ideal. “I’ll take it” was my response. So, now I was scheduled and I wanted to be prepared. I have been to Las Vegas and Reno, but never to Pahrump. I really don’t even like the desert after having spent way too many National Guard training periods and “summer camps” at Fort Irwin, but this was different. I knew of no one else attending during my dates although there were other more recent C7 purchasers in the club who had not yet attended, so my own research began. I went over my acceptance instructions and found the route to Pahrump was outbound on I-15 then left onto CA-127 in Baker and north across the desert to Shoshone and then a right on into Pahrump. Tuition includes breakfast and lunch for two days, so all I had to be concerned about was supper, but having been in the Army in the desert, I knew I could survive that. Instructions read that attire was optional, so I opted for shorts, polo shirts and a light jacket just to be cautious. I also read about the advice to wear driving shoes during training. I own plenty of shoes and have operated many Corvettes with no problem, but I had my eye on the Piloti driving shoes that were recommended. To get me focused on the training, now that my preparations phase was fairly complete, I spent some time reviewing YouTube videos posted by several past attendees. In retrospect, I think that was time well spent. Our November SCVCC meeting on 11-1 was the biggest distraction facing me with the Ron Fellows class date coming just 4 days later. The November meeting was my first one at the helm leading all of you fine members following our change in leadership. You told me it went well, so the following Sunday, Judy and I headed by the prescribed route in the Grand Sport to Pahrump. The courteous and helpful staff made our check-in smooth and we moved into very nice condo accommodations for our two-night stay. The second night was an optional add-on but well worth the minimal added cost to be up and running when instruction began at 0800 hours that Monday morning. 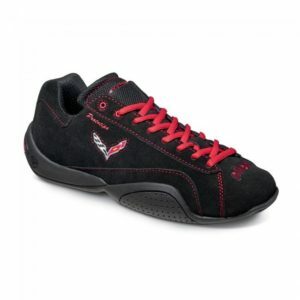 I obviously had to check out the Piloti driving shoes and did so after registration in the gift shop area. Yes, I bought a pair and found that they run a bit small, but the shop had my needed size 12½ in stock. I worried a little that I would be the dork in the class with the new Pilotis, but about half of the class was sporting them the first morning and throughout the two days. 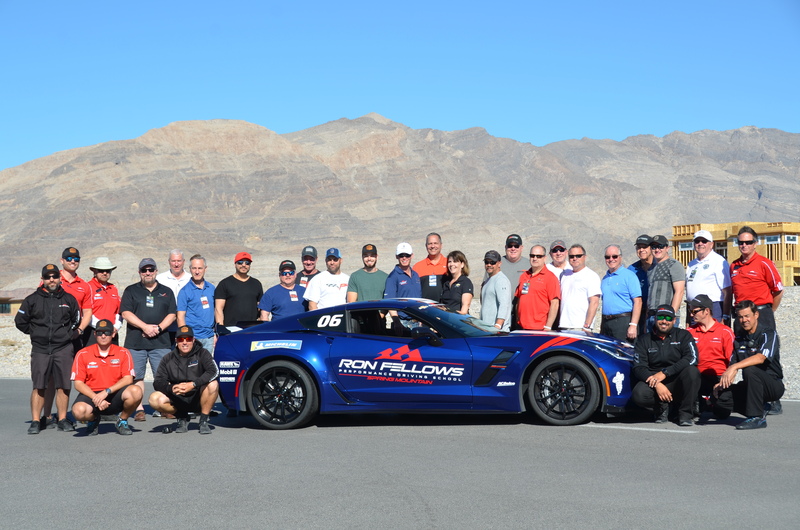 We have all attended meetings and training where the hours are posted we experience down time and eagerness to be done, but that was definitely not the case at Ron Fellows. Both days were full days, from 0800 to 1600 hours (8 to 4 civilian time). There was time to shop for souvenirs at the gift shop after training. 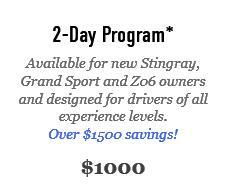 Our class of 20 all received training in Corvettes matching their own, Stingray, Grand Sport and ZO6, auto and stick. 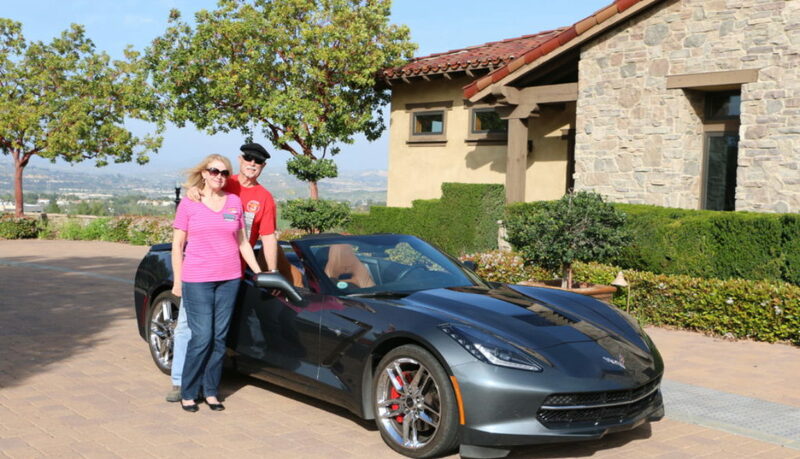 Attendees were in all ages and experience levels, from novice Corvette owner just learning how to put gas in to a couple with designs on breaking the course record. I might have fallen into the top third. The training gave us all a greater confidence in ourselves as well as the capabilities of our fine automobiles as well as hopefully making us more capable drivers in a very short time. The course is not one about speed, but it is about handling with speed being an element. Guests of attendees are welcome to participate in all classroom training sessions and are equally welcome to ride as passengers with instructors during track sessions. My co-pilot, your new First Lady, was initially a bit apprehensive about donning the helmet to experience the track but ended the training with a desire for more along with a greater appreciation for Corvettes in general and our Grand Sport in particular. Graduation was included in the program and personally, I am proud of my certificate of completion and hope any of you who can, will find their way to Pahrump to understand your Corvette more fully and to be an improved driver. The only drawback I have found after the course is experiencing how mundane regular roadways feel and am always looking for my next apex! In the President’s message you will read some glowing comments written by our past President, Dwight McDonald, about the members of the Board of Directors. It is my turn to tell you what your past president has done for this Club. The job can be thankless at times. He has made the tough decisions that are part of the job of the leader of an organization like the SCVCC. Some people may not have been happy with all of those decisions, but he always had the welfare of the Club in mind when he made them. It was never personal with Dwight, it was always SCVCC first. He bounced ideas off various Board members to ensure he got our opinions and then could take the right path. That is how he does business and it was much appreciated by the Board. Dwight is a person who is interested, not only in the hobby of Corvettes, but in the people who make up the Club. How many times has he greeted you at meetings and events and demonstrated his desire you get to know you better? He has volunteered his time and effort, not only as President, but when others could not step up to the plate. He did the communications position when no one volunteered, he spearheaded an effort to modernize the bylaws, and he just recently led the effort for our 40th Anniversary Car Show. His time is valuable, like everyone else’s, but he never let the Club down. I have enjoyed my time as Secretary and it can be time consuming, but I was continually amazed at the time Dwight put into the operation of the Club to ensure all went right. I will admit he tells some tired jokes on occasion, but people still laugh because his personality still makes them funny. Don Ceo may not miss all the short jokes, but I know he will miss Dwight. All the Club members should realize he had their best interest at heart. I believe I speak for the entire Board; we will all miss him. I wish Mike Woodings the best as the new Prez and I know he will fill the shoes just fine. 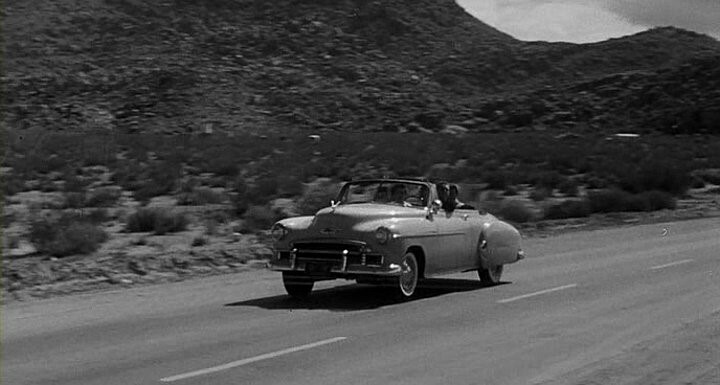 It was 1959 when I trundled off to college in my 1950 Chevy convertible. It didn’t make the 200 miles to San Luis Obispo without breaking down. I had installed a 283 ci small-block in place of the “stove bolt” six, but my skills were limited and after four years, it was used up. My generous parents thought they ought to replace my first car in my junior year of college and in 1962 they gave me a used Corvair. It got great mileage but it was hard to drive because I couldn’t see very well with the paper bag on my head. The eyeholes were never quite aligned. I was embarrassed to be seen in the econo-ride. Fast forward to 1963. 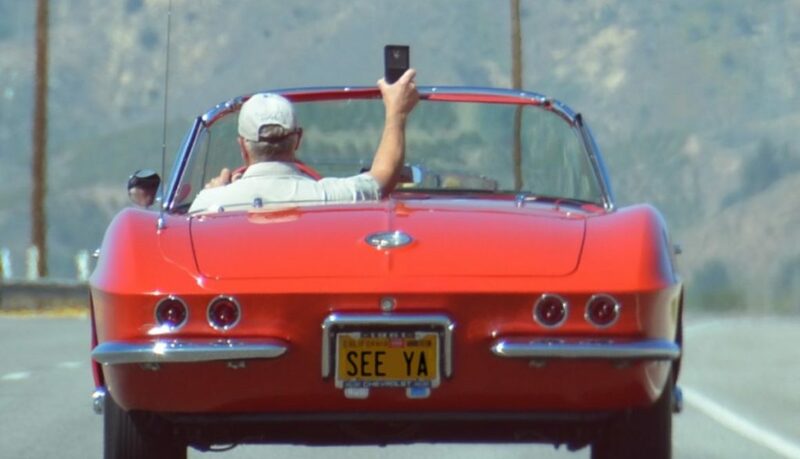 I was driving the ’Vair down Valley Boulevard near my folks’ apartment in Alhambra when I stopped at a traffic light and some dude drove up next to me in a beautiful red ’58 Corvette. It had a “For Sale” sign in the window. I had him pull to the curb and asked why he was selling it. 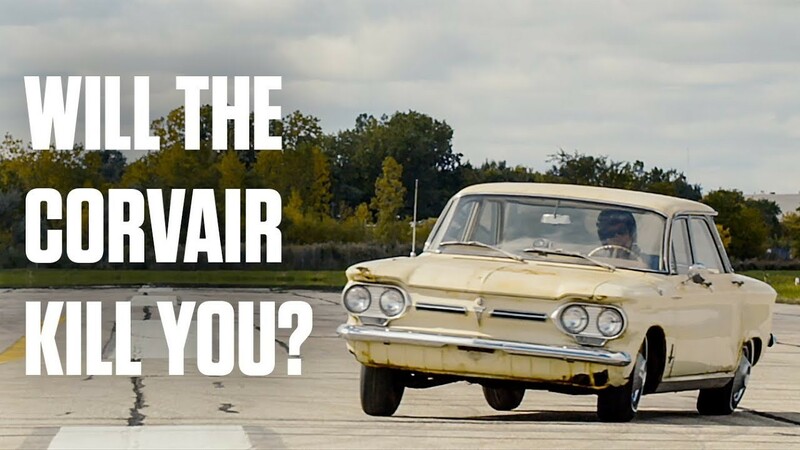 He said it was a gas hog and he wished he had a Corvair like mine. 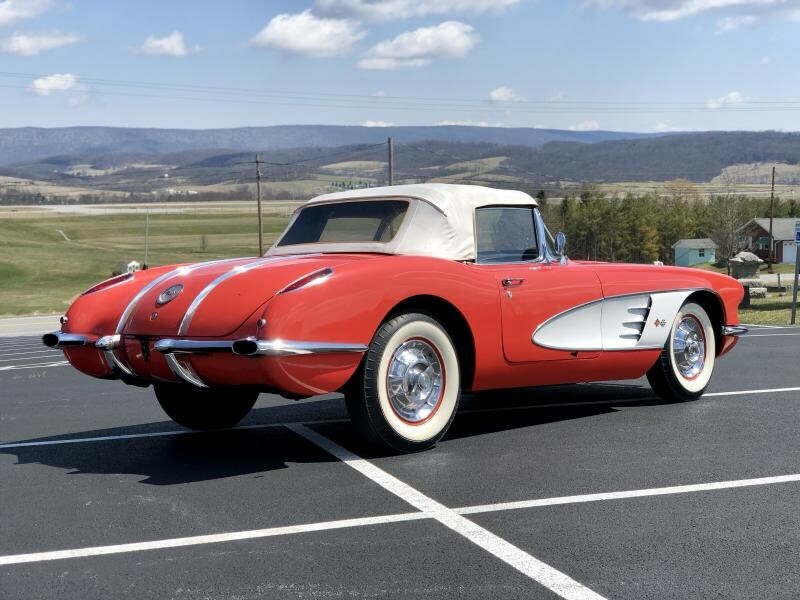 He said he wanted $1,200 for the ‘Vette and I said, “What a coincidence, that’s exactly what I am asking for the Corvair”. We met an hour later at the same location and exchanged “Pinks” and cars. I was able to hide the red roadster from my parents until graduation, more than two years later. Thus began the passion with the plastic cars. Two years ago and now an old man with 23 body-off restorations, I retired from the hobby and sold the seven old cars in my collection. Recently, I found myself in fair physical shape and watching too much TV. I decided I had one more resto left in me. 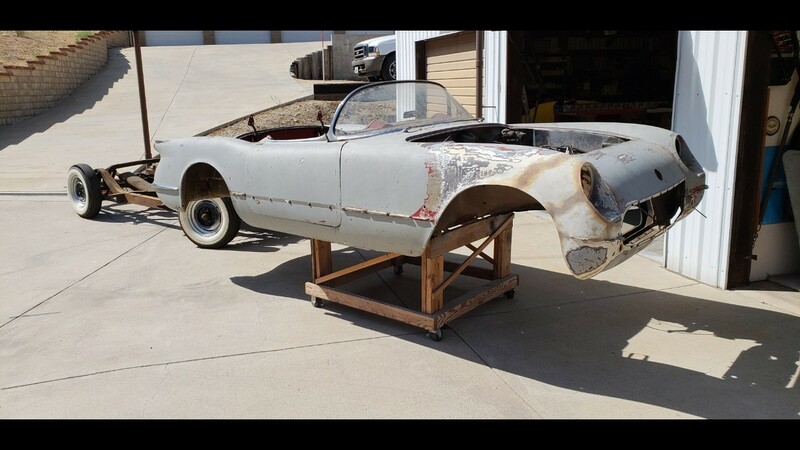 An old friend from NCRS died a few years ago and I discovered he had left a relatively complete, but thoroughly thrashed, 1954 Corvette on jack-stands in his back yard for 40 years. It’s now in my shop with the body already on a dolly. I’m busy again and happier than ever. Please feel free to stop by anytime if you would like to see it. Wear work clothes! P.S. Many thanks to Jim Fulmer, Dwight McDonald and John Noble for all their help in the relocation to my shop. Things have been going well in our corner of the Corvette world since my earlier reported issues with the Grand Sport. Caravans and trips around the area in both the C1 and the C7 have been great. 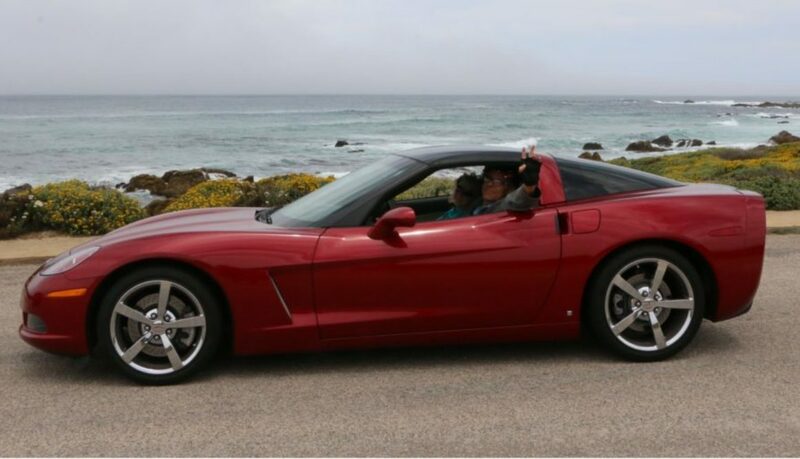 My long-anticipated weekend at the Solid Axle Corvette Club National Convention in Ventura was on the calendar. The ’62 was looking good, ready to join its cousins coming in from all over the country. A final local test run was done and all was A-Okay until I pulled into the garage and the right front tire went flat. It was just a cracked valve stem, so it was an easy fix. An early drive down SR 126 was delightful and we were happy to join the assembly of gorgeous C1s already in the hotel lot. Then some overheating reared its ugly head, leading to a AAA transport back home until the water pump could be addressed. Fortunately a well-shined Grand Sport with a full tank of gas was standing by and I quickly returned to enjoy the weekend that was ahead in Ventura. We actually felt fortunate to have air-conditioning as the heat wave arrived. So, why the C7 Update you ask. Well, Monday came and with the Grand Sport all packed-up we headed out for our return home. Then, we heard a scraping noise. You remember that scraping noise I told you about, don’t you? Well, I remember it well. We drove home and it wasn’t our imagination. It was the same dang noise that led to replacement of the torque tube. The call went in to Santa Paula Chevrolet and they kindly picked up the Grand Sport and I rode along to the dealership to discuss the situation with the service department. I expressed my concern about the torque tube and after an initial triage, the diagnosis came back as a problem with the belt tensioner. I wasn’t convinced but went home to await what I was told would be a quick fix. The following day, I received the call I hoped would be to come get my Corvette and live happily ever after. The belt tensioner was replaced, but mechanics heard a scraping sound. You remember that scraping noise I told you about, don’t you? New diagnosis…replace torque tube. 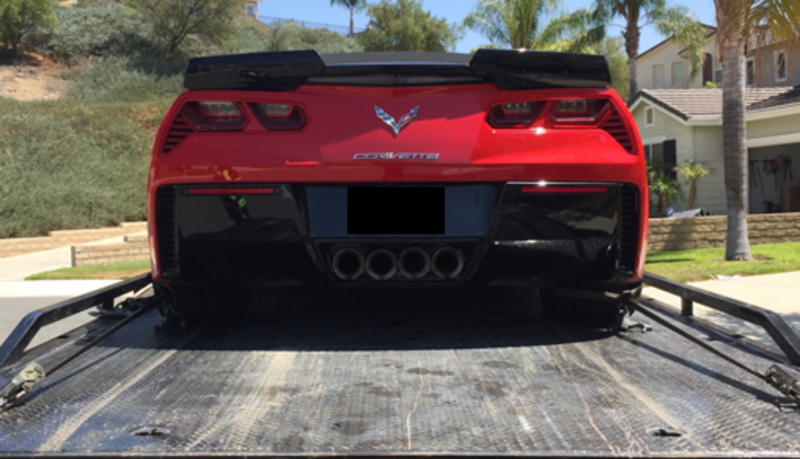 Corvette Forum and our own Tommy Couples have lots of info on the situation with these moving parts and we are learning more and more about these complicated C7s as we go. 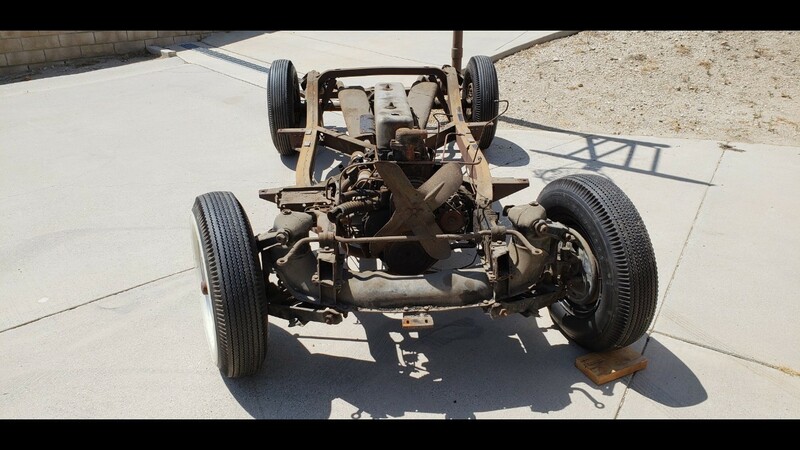 Thankfully, the ’62 just required a $50 part held on with 4 bolts and it should be good for another 50 years! I took my Vette to Santa Paula Chevrolet to have its annual service performed, knowing it needed it prior to the MPCC run. When I left to go home I had an ‘In Awe of Moment’ which I’ll get to later. As always, we (SCVCC club members) are treated fantastic. I checked in and had a brief conversation with Monty, my service writer, to go over my areas of concern. He assured me it would all be handled along with the bow to stern inspection and a wash. On my way into the show room, I stopped in to John Macik’s office to say hello and thank him for all he does for the Corvette community. Well, that ‘hello’ lasted about 30 minutes. He’s a very approachable man, which says a lot for his organization. Following our conversation, I went across the street to grab a hoagie sandwich while I waited for my car to be completed. It just felt like the right thing to do. I’m not sure why, it just did, drive-n-eat. After eating, it was now shopping time! I love messing with the sales people. They just have this pre-conceived idea of what I can or can’t drive. It’s entertaining. Anyway, I found the car I want, a 2018 Chevrolet Corvette Z06 3LZ, Ceramic Matrix Gray Metallic with jet black interior, 650 HP. 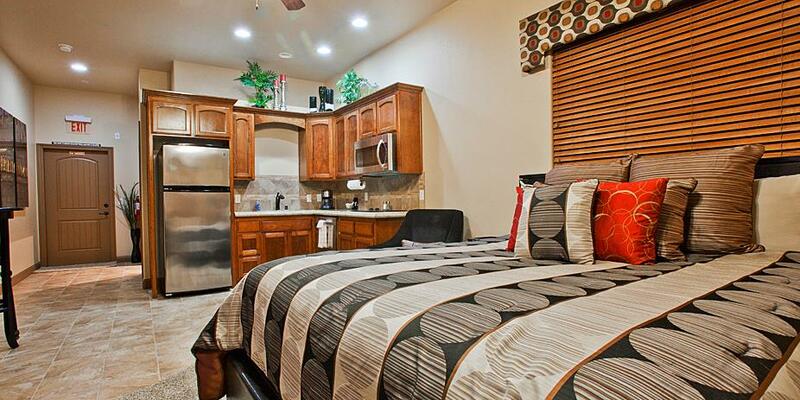 Only $105k. The dream will continue. I finalized my business for the day, got in my car, and headed east on Harvard Blvd. At the light at Palm, I was waiting for my light to turn green so I could turn right to go the freeway and home. It was then I saw a beautiful young woman. She was a 10 out of 10, waiting to walk across the intersection where I was going to turn. I waited patiently for her to cross and proceeded to make my turn. As I turned, I noticed a middle-aged man in a mid-sized tin can waiting to go straight as the woman crossed the street in front of him. I watched the man watching the woman, or so I thought. Upon completing my turn and driving past the tin can, I caught the ‘in awe of moment’. I realized he was not watching the pretty woman. No, he was watching my car and rubbernecking his head until it was virtually facing backwards. I could see he was in total awe of my car. I must admit, his reaction was a bit of a surprise, extreme, and made me laugh. This type of reaction happens frequently. It made me think how special it is to have such a great car and to be able to enjoy it year-round. So for now, with a smile on my face and the roar of “The Mighty LS3” at my back, I bid you adieu.